Dhol Academy is made up of players and performers of both sexes that bring colourful rhymes to it entertain the crowds as a marching band or run workshops for budding Dhol enthusiastic. DA can be fully acoustic or it can work to a range of soundtracks from Bhangra, Bollywood, Hindi, Reggae, R&B, Garage, House and many more. The performances have a universal appeal, which can be adopted to meet individual's or event organiser’s needs. DA respects 2 Dhol Blasters, The Dhol Foundation, Ministry of Dhol, Babba Fathay Singh Gathka group and all other Dhol and Bhangra groups. 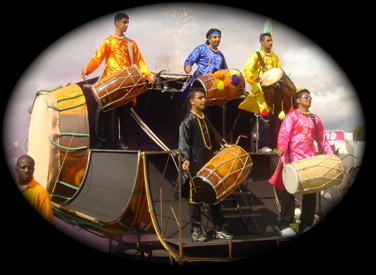 DHOL ACADEMY is traditional Indian Dhol drumming group with a difference; this group has amazingly loud, explosive, enthralling, exciting sounds suitable for attracting and capturing huge crowds. The Dhol performers dress in bright and colourful costumes of traditional themes to compliment all types of carnival and cultural events. The highly charged and powerful rhythm sounds are ideal for most stage performances. Dhol Academy now brings something-extra special to major events by doing displays in a BIG way. They were “Fantastic", "Excellent", "The crowd loved it", "More! More!" and "we want you back here again" are some of the responses the group gets from the crowd and organisers.